The Down Placers are seeing double when they spend some time with Hammer’s Twins of Evil (dir. John Hough). While discussing the film, Casey, Derek and Scott fall under the spell of Dennis Price, marvel at the Collinson twins and have conflicting emotions about both simultaneously enjoying and being terrified by Peter Cushing. And if you listen real close, you might hear someone change their Top Five list. 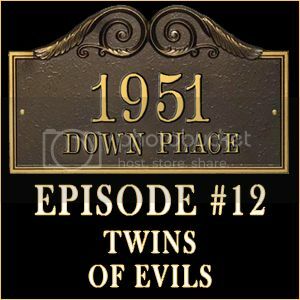 Download 1951 Down Place: Episode #012 here! Fine, Harry. Interview with Richard Klemensen. Little Shoppe of Horrors. May 1984: 37-42. Print. The Flesh and the Fury: X-posing Twins of Evil. Dir. Daniel Griffith. Synapse Films, 2012. Blu-ray. Gates, Tudor. Interview with Bruce G. Hallenbeck. Little Shoppe of Horrors. May 1984: 42-45. Print. Hallenbeck, Bruce G. British Cult Cinema: The Hammer Vampire. Bristol: Hemlock Books, 2010. Print. Hallenbeck, Bruce G. “Pray For Me, Weil! The Karnstein Trilogy.” Little Shoppe of Horrors. May 1984: 28-37. Print. Hearn, Marcus. Hammer Glamour. London: Titan Books, 2009. Print. The Horror of Hammer. Image Entertainment, 2001. DVD. Taste the Blood of Dracula. Dir. Peter Sasdy. Perf. Christopher Lee, Geoffrey Keen, Gwen Watford, Linda Hayden, Peter Sallis. Warner Home Video, 2007. DVD. Twins of Evil. Dir. John Hough. Perf. Peter Cushing, Dennis Price, David Warbeck, Madeleine Collinson, Mary Collinson. Synapse Films, 2012. Blu-ray. Twins of Evil. Dir. John Hough. Perf. Peter Cushing, Dennis Price, David Warbeck, Madeleine Collinson, Mary Collinson. Synapse Films, 2012. DVD. Vertlieb, Steven. “Why the 1970s Bite.” Midnight Marquee Studio Series: HAMMER. Ed. Gary J. Svehla and Susan Svehla. Baltimore: Midnight Marquee Press, Inc., 2011. Print. Loving the show guys, Big thanks from sunny Scotland.